These culprits are responsible for most of the problems you experience when you sit down to write and become immobilized. They are responsible for preventing you from getting started, from finishing projects, keeping you stuck in the middle of your work. These stumbling blocks create resistance to writing itself. They diminish belief in ones' talent and ability, preventing you from getting your work into the marketplace. They also can cause low self-esteem and insecurity, decreasing creativity, while increasing stress and depression. What happens when you become blocked? Do you give up in frustration? Do you obsess over your block? Next to each block write about how each affects you? From which of these do you suffer the most? All of them? None of them? Some of them? Identifying your block is the first step to overcoming it. The following exercise will enable you to identify and overcome your specific block. Read over the six stumbling blocks. Now rate each block from 1-6, the worst block being number 1. After you've written how these symptoms block you, you are on the path toward overcoming them, because you are now aware of what specific blocks you have. This awareness is the first step to overcoming a problem. The second step is writing anyway. Just write in spite of being blocked. Just take the action and write. Although these states can cause writer's block, the two most prevalent are procrastination and the inner critic. They are the two biggest stumbling blocks to writing success. 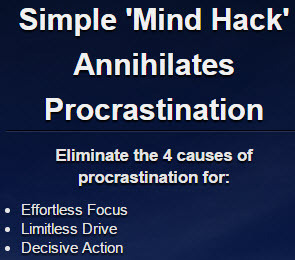 The most common reasons for procrastination are usually psychological and unconscious—hidden from your awareness. On the one hand if you desperately want to write and yet don't, this can cause you great pain and suffering. On what seems a conscious level you aren't willing to put in the hard work and discipline to overcome your blocks. However this is really an internal conflict which may stem from fear of failure or fear of success. These fears will unconsciously sabotage any long term attempt to keep working on a script. They manifest themselves in the form of procrastination. They not only prevent you from completing your writing but eventually lead you to feelings of low self-esteem, guilt and shame. Your internal messages may say to you, "Why don't you have any discipline or will-power?" "Why can't you set goals and reach them?" The questions remain unanswered, because the real reasons are safely hidden away in your unconscious, just waiting to attack you when you least expect. These fears are probably related to your childhood perhaps when a parent or teacher said, "That's not the way to do it," or "Can't you ever get anything right?" "Why can't you be perfect?" Although these messages are different from fear of success, they all stem from the same source. The inner dialogue says, "You don't deserve to be successful." or "You aren't good enough to make it." In either case the outcome is the same—you procrastinate and don't write your screenplay. Another reason you might procrastinate is you have what is called low frustration tolerance. This means you can never deal with frustrating situations or tasks, so you look for ways to avoid taking the action, which in this case means avoid writing. You might divert yourself with activities that provide immediate gratification and escape like eating, drinking, going to movies, talking on the phone, watching television, or even cleaning the refrigerator. These activities take no discipline or concentration and relieve your inner anxiety. You then don't have to put in the long hours and master the craft of writing. You are blocked. One of the best ways to overcome procrastination is to enter therapy and explore your memories, dreams and unconscious and bring these negative messages into your awareness. However, a more direct way to overcome procrastination is through your behavior. TAKE ACTION! When you act against your fears you start to conquer them. Don't think about writing. Don't fantasize about writing. Don't worry about it or feel guilty about it. Just do it. 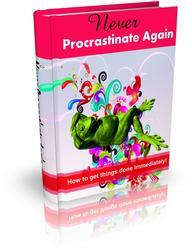 Suddenly, you'll find the time and energy you wasted in procrastinating, you'll now use to get your writing completed. Imagine if you will, that you are about to sit down and write when suddenly you're stopped in your tracks. The voice of your INNER CRITIC is beckoning you. When this happens you feel frustrated, lonely, angry, depressed, hopeless, and helpless. You ask yourself if you'll ever write again. You feel out of control and don't know where to turn. But all is not lost. Let's look at some steps you can take to deal with your inner critic and start writing again. The first thing you want to do is identify the inner voice who talks to you all the time. This voice that's filled with criticism, self-doubt and negativity. This is the voice whispering from your childhood and may be the voice of your critical parent, your peers, or your teachers. It's a voice that once belonged to someone from your past that you have now integrated as your own critical voice. It stops you before you even get started writing. It fills you with insecurity and doubt about your ability to write. It damages your self-esteem and blocks your creativity. What can you do about it? How can you get rid of it? One of the successful techniques I have developed is the following exercise. Write down all the negative self-talk you hear every time you start to write. Why don't you do that right now. When you hear the critical voice immediately write down whatever it's saying to you. It could say things like: "Get a real job." "Look who's trying to be a writer." "You have nothing new to say." "There are too many good screenplays already written." "Get serious! You can't write." These are a few examples of the put downs you say to yourself, before you even get started to write. All these negative messages and self-talk makes it almost impossible to write. They stop you in your tracks before you even get started. You have to know how you're stopping yourself by jotting down your negative self-talk as fast as you can as you're experiencing it. Read over everything you've written. Is all of it true? Part of it? None of it? Fill the entire page. The next step is to recognize whose voice is talking to you. You'll break through your block by identifying the voice! Whose voice is it—mother's, father's, relatives, peers, teacher's? Or is the voice a combination of all of them? After you've identified the person or persons shouting all these insults at you, write down their name next to each negative remark. Read over the criticisms once again. Now ask yourself if what they're saying about you is true. Next, take a clean sheet of paper and write a dialogue with the person (s) who said all those horrible things about you and your writing ability. Tell them all the things you wanted to say, but never was allowed to express. It would have been too scary for you and you would've probably been punished. Let them know how you feel about what they've said to you and how it hurt you all these years. After you've written to them you'll probably realize how silly and ridiculous it is for you to allow people from your past to still have this power over you. Don't permit their criticisms to stop you in your tracks when you want to write and realize the voice is not telling you the truth. So take away it's power to block you. Stop listening and start writing. Carry a notebook and record your negative self-talk every time you hear it. (I imagine you'll be writing most of the day at first.) By writing the criticisms down you will see how insidious your negative self-talk is and what a hold it has on your writing ability and on your self-esteem. Continue to write positive statements beside the negative remarks to counteract them. You've been carrying around this critical voice for years. Now is the time to let go of your inner critic and silence it by refuting what it says. Take away its power and give your creativity back to yourself. Now, create a written list of positive statements about yourself as a writer and read them over until you memorize them. Use these to silence your inner critic as soon as it begins to criticize you. Remember the inner critic has had a full time job criticizing your writing and you, so you must be vigilant in your counterattack. Next time the "inner critic" starts shouting negative comments to you—IGNORE IT! Tell it to be quiet. For 21 days read your positive statements every morning when you wake up and every evening before going to bed. Believe what you've written. If you don't believe in yourself and take yourself seriously as a writer who will? These techniques really work and writers have overcome blocks by diligently working hard to break through them. Breaking free from blocks can be an exciting, exhilarating, experience! When you overcome your writer's block a wonderful thing happens—you'll feel a new sense of "lightness" and freedom when you write. To this end I have developed ten keys for you to unlock your blocks.